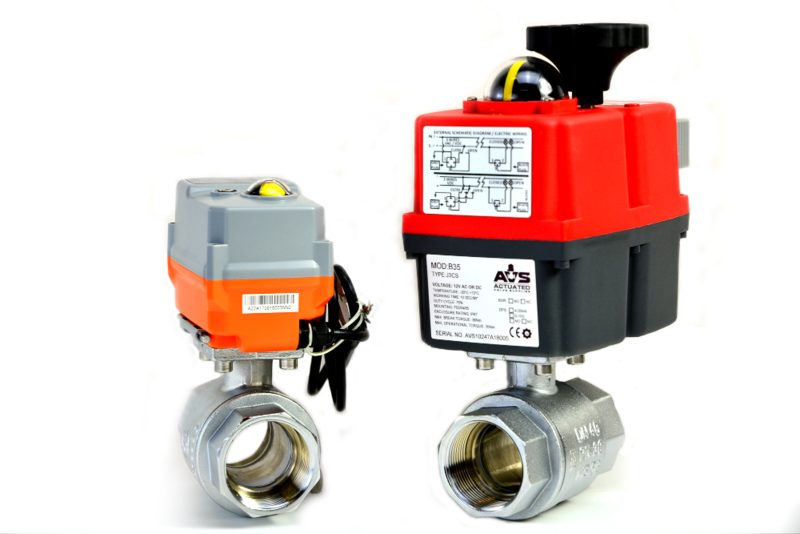 Just two of our varied range of electrically actuated ball valves: a J+J J3C series electric actuator and an AVA basic electric actuator, both fitted to 2″ brass ball valves. The J+J electric actuator (J3C series) on the right, and the AVA basic actuator on the left are both available from stock and can be shipped for next day delivery or picked up from our distribution center in Matlock. The compact size of the AVA actuator is its most appealing feature to engineers. Original equipment producers, system builders, developers and others have, for a long time, needed a commercial-grade electric actuator that is effective but has a smaller installation footprint. The AVA electric actuator is often 2/3 the size of a more traditional design of valve-actuator, whilst delivering an equivalent torque output. The J+J conversely offers DIN plug connectivity that allows for an extremely quick installation or replacement with minimal risk of error.